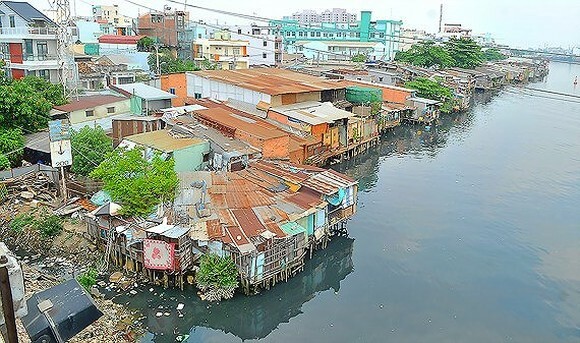 In its document to the Ho Chi Minh City People’s Committee, district 8 People’s Committee has proposed a special mechanism for the urban renewal project to remove households alongside Doi canal in wards 8, 9, 10, 12, and 14. The project will reclaim nearly 54,300 square meters and at present, district 8 authority is carrying out land reclamation for the urban renewal project; however, through survey, 90 percent of inhabitants along the canal have not granted certificates of land use rights. The district administration said that removal of these people will cause massive upheaval for their lives while there has been a shortage of land fund and social houses for relocation and resettlement of 3,550 dwellers from 1,013 households in reclaimed land. Therefore, district 8 administration proposed special mechanism for people’s benefit to facilitate the project as well as improve dwellers’ living condition after reclamation. Specifically, owners of these houses with half in land and half in canal will receive an additional amount of money in addition to a sum according to the present law. For instance, people whose temporary shelters were built before October 15, 1993 will get a sum equal to 40 percent of their temporary accommodation’s value less than 40 square meter per household. Whereas dwelling units were built from October 15, 1993 to July 1, 2004 will get a sum worth 30 percent of their temporary accommodation; their neighbors whose houses were built from July 1, 2004 to July 1, 2006 will receive a sum equivalent to 20 percent of the accommodation value..